So excited to be able to say that PLAY TO LEAN, the book Sharon Boller and I have been crafting, writing and assembling is finally available. The book is based on a workshop we’ve been conducting for years and combines our findings, best practices, aha moments and game design thinking insights. We’ve put these “lessons learned” into one place so your development of a learning game can be much easier than our trials and tribulations. 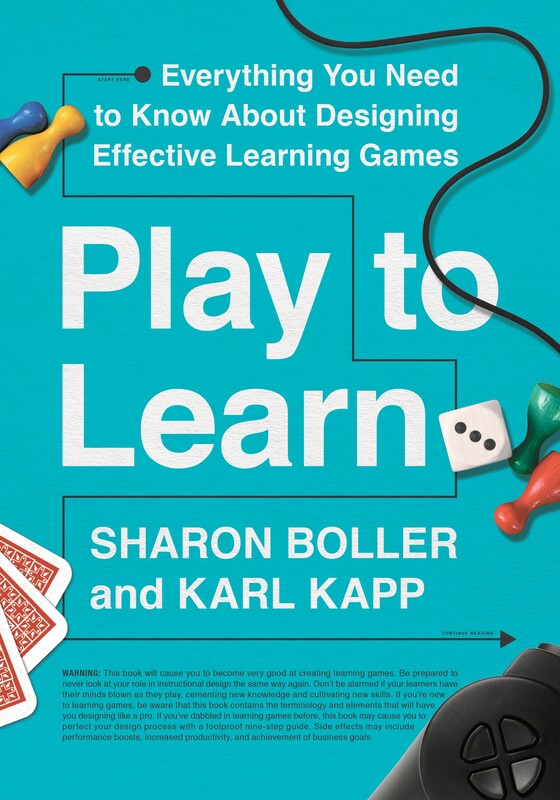 This is the book we wish we had when we first started developing learning games decades ago–complete with worksheets, tips and tricks and sound advice. Even sample scoring tables. It is a step-by-step sequence for eLearning Designers/Developers, Instructional Designers, Faculty and anyone else creating a learning game. It’s got examples, worksheets and even a link to a game you can play to reinforce knowledge from the book. It’s not focused on digital games either, we talk about learning board games, learning card games and learning mobile games. I suggest the best way to read the book is to form a “book club”, discuss the book and implement the ideas from every chapter each week (you can combine the first two weeks) and then you’ll be creating a learning game in no time (well, in 8 weeks if you do a chapter a week combining the first and second week–but you get the idea). So to help everyone learn a little more about the book so you can see if it’s right for you and your team, we’ve put together a tour with both blog stops and live stops. Here is the list and, please join the tour, we’d love to hear what your experience is with learning games. Also, look for a few surprise stops. I had a wonderful conversation the other day with brilliant game design thinker Amy Jo Kim and that discussion will be posted shortly. Also, my friend Kevin Kruse and I are getting together soon and I know we’ll have a great conversation you’ll want to listen to as well. So check back here often for new stops. If you’d like (and I hope you do). 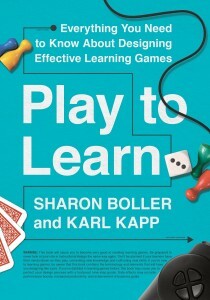 You can order the book “Play to Learn” through ATD Press or Amazon. To learn even more, you can even attend a webinar where Sharon and I will share tips and best practices from the book. The webinar is on Tuesday, March 28th at 1 pm ET / 10 am PT. You will hear our perspective on the three most critical learning game design steps and have the opportunity to participate in Q&A. You can register for the webinar here. Finally, this is 2017 so follow the action on Twitter with the hashtag #Play2Lrn and follow me on Twitter @kkapp for more special announcements and surprises.